The Isreal Vibrations are Cecil "Skeleton" Spence, Albert "Apple" Craig and Lascelles "Wiss" Bulgrin. They are one of the most memorable vocal militant Dread groups in the history of Jamaican music. Their off-key harmonizing is impressive as their creer is. They originally met at the Mona Rehabilitation Centre in Kingston after being affected from the late 50's polio epidemic. After a typical late 60's Rock Steady start they found Rastafari - or as should be said Rastafari found them - and they begun to put counscious themes in their armonies. This caused them to be thrown out of the Centre. They found themselves doubley hadicapped in ftont of the Jamaican society: disabled plus Rastafari didn't sound good. The Twelve Tribes of Israel helped them sponsoring their first recordings at Duke Reid's Treasure Isle Studios in Bond Str, Kingston. Out of those sessions came "Why Worry". The producer Tommy Cowan, after the almost instant success, comes in and this incredible debut album is released. From that moment the group will lead - among others - the path to the 80's and over. From a certain point of view all Israel Vibration's personality is already present in this set. It is all filled of peaceful slow deep Roots vibes and praises to the Most-I as the only one that makes things possible. This is evident in the title track "The Same Song", "Weep and Mourn" and "Walk The Streets Of Glory". "Why Worry" is explicit in its lyrhics: "...why worry... I can pray". The best song is "Lift Up Your Conscience". This is such a pure statement of how one should feel and act that when you hear a slackness or false rasta tune a disgusting feeling comes up. Earthquake, Lightning and Thunder pon dem. "Prohet Has Arise" is another strong statement that points the Rastafari vision at center. This is the Israel Vibration telling the truth. On Wednesday, August 4th 1982 The Gladiators and Israel Vibration played at Reggae Sunsplash in Jarrett Park, Montego Bay, Jamaica. I am pretty sure that they played separately and this album presents them both. By some obscure meaning Genes Records decided to compile this release alternating one song from The Gladiators and one from Israel Vibration. Meaningless. My suggestion is to play all the songs from one group straight and then play the other one the same way. Or better than this re-record this live album by yourself putting side by side each group's tracks: this way it works, believe me. Both groups play six songs so the performances are quite concise. Both play what would be expected: classics from their own repertory. Roots music live! The Gladiators peak is reached directly with the opening song "Roots Natty" and the closing one: a first class performance of Bob's "War". The rest is properly delivered but it lacks the necessary vibes. Now it is the time to talk about Isreal Vibration. They open with a deep "Fight To Survive" that underlines their power when they are on stage. The right vibes are delivered with the second song too: "Highway Robbery". The third track "Never Gonna Hurt Me Again" is not something that I would die for, so I feel it as nothing more than ordinary Israel Vibration quality. "Jah Jah Time Has Come" is Israel Vibration indeed but not at their best. Their fifth song is a marvellous "Friday Evening". They close with "Licks And Kicks": one of their best songs. Let's talk about the heart of the matter. The Gladiators could have been better. Israel Vibration were great! Do not miss this live album! (Read the stars as 3 for The Gladiators and 4 1/2 for Israel Vibration). This live set presents Israel Vibration as a duo with Cecil "Skeleton" Spence and Lascelles "Wiss" Bulgrin. The tracks come from the 2003 French tour. The intro is "Rock Fort Rock" and is intended to present the band. The cover calls it "Warm Up", and it demonstrates the poor knowledge of the Nocturne label compyler. The confusion continues with the third track called here "Rock Fort Rock" which is not. Aside from the silly typed titles from Nocturne, this is a very impressive set. Twentyfive (!) years from their debut with the "The Same Song" album, Israel Vibration are still fully able to sing and deliver a strong Rastafari message. And entertain too. Things get serious on the fifth track: a straight "Vultures". A classic in their live performances. Follows "Level Every Angle": precise and touching. "Get Up 'N' Go" is one of my favorite tunes from Israel Vibration and here is beautiful. "Why Worry", from the debut album, is deep as it must be. The other song that I love from Israel is "Cool And Calm" which is perfectly fitting the vibes here. The third masterpiece here is "Licks & Kicks". The songs are delivered one after another as if Skeleton and Wiss were still young. The voices are still powerful. The sound is strong. The songs are great. A great live album! The 70's are gone since a long time but Israel Vibration seem to be unaware of this. But do not misunderstand me. This is not a nostalgic (read as poor) set. This is great Roots music. If you like them here you will find some beautiful music with some songs that in the mean time have become pure classics. "Poor Man Cry" opens with a declaration of how sad is the condition of the poor in contemporary Jamaica. "Children Under The Sun" calls for the strength of the youth, by the youth. "Racial Discrimination" talks about the neverending struggle for equality. Follows the great Rastafarian declaration of "Soldiers Of Jah Army". "Reggae On The River" is a slow tune that works quite well, even if maybe it is not as effective as other material here. 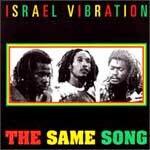 "False Pretence" is a typical old style Israel Vibration song. Here there is really no gap between the end of the 70's and 1991. "Be Carefull" stands on the same level. "Live In Jah Love" calls for a spiritual approach to life on a quite rocking mood. "Red Eyes" is a ganja anthem on which is quite impossible to stay fixed on the ground with your feet. The set closes here. There are three Dubs as bonus: "Poor Man Dub", "Dubbin In The Sunshine" and "Discriminatory Dub". Great Roots for a set that almost lacks any low peaks! This nine tracks album is a masterpiece. Here Israel Vibration shine. The set is permeated by a dark and enlightning musical deep atmosphere that elevates almost all the tracks to the status of classic compositions. The producer Henry "Junjo" Lawes, whose only name brings to mind some of the best early 80's Dancehall sets, for sure is responsible for the deep sound of these recordings. The atmospheres from Lawes are hot, but the "cool and calm" moods are strictly an Israel Vibration distinctive feature. This mixture of characters, which could sound contradictory, delivers a deep, dark and perfect result. The gems are the title track "Why You So Craven", "On Jah Solid Rock", "Morning Light" and "What's The Use". The remaining tracks are no less impressive. The set was engineered by the great Scientist, voiced at Tuff Gong, and recorded and mixed at Channel One. Maybe the best set from Isreal Vibration. A masterpiece. Note: my original copy from RAS label lacks the deep bass frequencies that for sure come with the original master tapes. If the cover is that good, probably the whole set is as well. Well, it is 1988 and the Roots golden era was almost over ten years before this album. At this point in history are the Israel Vibration a nostalgic group filled with obselete vibrations? Not at all. Opening with two classics ("Cool And Calm", "Jah Love Me") the set offers another super huge Roots track with " Greedy Dog". It it over here? Not yet. "Don't Want Apartheid" with Apple Gabriel on front speaks by itself. If you hear someone say that Roots was unavailable in the late 80's, deliver him here. Here the Roots Radics play, Dr. Dread and Israel Vibration produce. Unmissable!